If there were Olympic medals for the performance of toys, playdough would be a winner. Let’s go for the gold with some Olympic playdough activities. Playdough comes in all colors of the rainbow but not exactly gold, silver, and bronze. Those colors are found in the pot at the end of the rainbow. 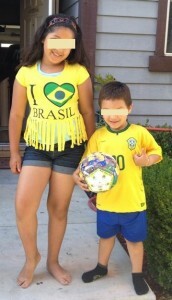 However, kids are usually quite happy with whatever is available. 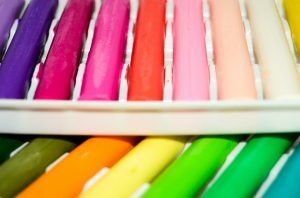 Playdough comes in many varieties, from plasticine to cloud dough, and is made of different ingredients like shaving foam or mashed potatoes. Little Sister played with some yellow. 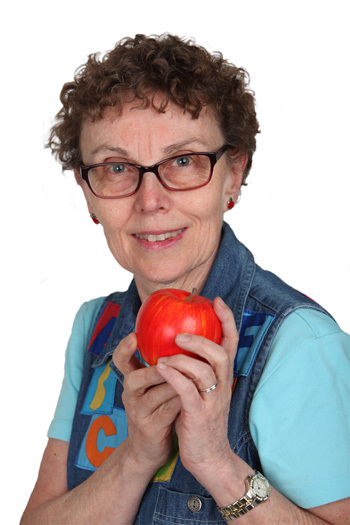 Her Olympic ring isn’t exactly round, nor are the medals, but she is directing her own play and creating what she likes. Some kids like to use tools with their play dough such as cookie cutters, a rolling pin, a plastic knife, small lifter, molds, and even scissors. 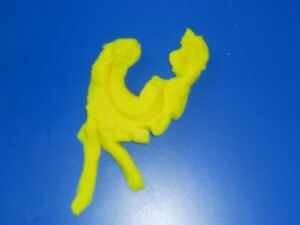 Playdough is easy to cut and a great choice for scissor practice. But tools are not necessary for fun. Kids can pat, smoosh, pound, squeeze, roll, and engage in Olympic playdough activities without them. 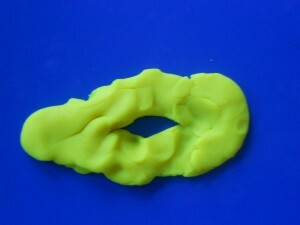 Playdough builds strength and dexterity in the small muscles in the hands, wrists, and fingers. Fine motor control is still developing at this age. These are skills kids need later for printing and other activities. Playdough isn’t a talking toy but there’s lots of conversation. As kids show and tell, they are using descriptive language and adding to their vocabulary. Besides hands, brains are very active as kids play with playdough. Problem solving, concentrating, and planning are some of the mental strategies kids are practicing. 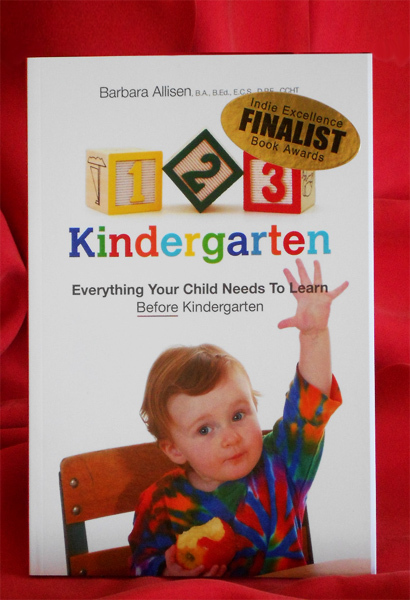 On an emotional level, kids are developing their self-confidence and learning to handle frustrations. There’s plenty of opportunity to be creative. 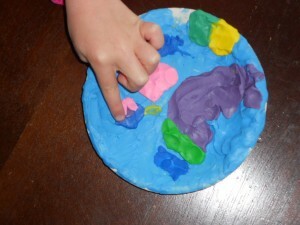 Imaginations can go higher, faster, and farther with play dough. 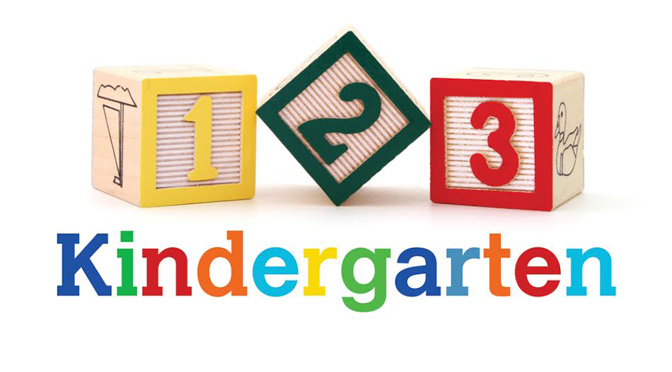 It can be part of children’s pretend play. 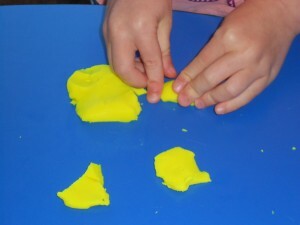 In terms of sensory play, play dough certainly stimulates the sense of touch but also seeing. If you are making a batch at home, add in a spice, a few drops of essential oil, or kool aid powder for smelling. In addition to Olympic medals, there are so many other things kids can make. They will have their own ideas, things that are both in and out of this world. What score would you give playdough? Now that the Olympic Games include beach volleyball, it’s time to play in the sand. Beaches are fun but not necessary for sand play activities for kids. 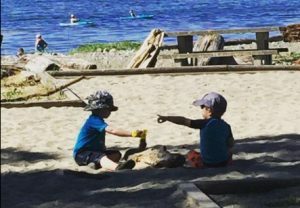 Just like water play (see yesterday’s Water Play Activities for Kids), there are many ways for kids to play in the sand. Of course, what could be more fun than digging all day and making sand castles at the beach? Time at the beach is a summer highlight for many families. But kids can make their own small beaches right at home. Some fortunate kids have an entire sandbox in their backyard. If not, many communities have sandy areas in parks or playgrounds. Even small quantities of sand are fun. Pour some into a container like a big bowl or bin. Spoons, pails, plastic shovels, scoops, cups, and sieves are great tools for scooping, molding, piling, digging, pouring, creating and more. Sand play is sensory. Most skin on the body enjoys feeling sand. When you think about walking on the beach, do your toes start to curl? (Sand can hurt and irritate eyes so kids may need to be reminded not to throw.) A handful of sand is light, but a pailful is heavy. Ears have to listen closely to hear the sounds of sand when pouring and scooping. Besides touch and hearing, sand stimulates sight too. There’s lots to see even if it’s mostly the same color. 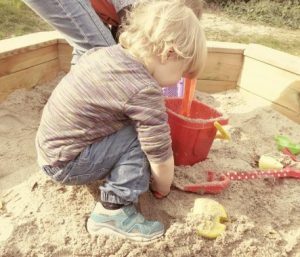 Sand play activities stimulate imaginations. Who lives in the sand castle? There could be kings or dragons. Kids enjoy playing in sand with dinosaurs and small plastic animals. They like to build roads and create towns and cities, or farms and zoos. Children’s actions as they play with sand are often repetitive, such as filling a pail and pouring it out over and over. This serves a tremendously important brain function, allowing some parts to take a break while other parts connect and sort out learning. Of course, it’s also fun to kick or toss a ball around in the sand. How does your child like to play with sand? 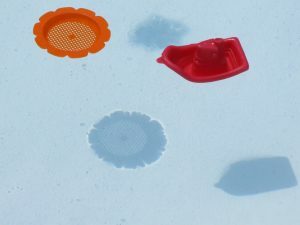 All the Olympic Games excitement in and on the water with medals and new records is splashing up some water play activities for kids. For kids, water play might take the gold medal. In Rio, there are events for diving, swimming, rowing, sailing, and water polo. Just like the Games, there are many different ways for kids to play in and with water. In the summer, a favorite way is to splash and cool off in a pool, small kiddie pools or community ones. Sometimes, grownups can’t resist and will sit close with their feet in. Doesn’t the water feel refreshing? 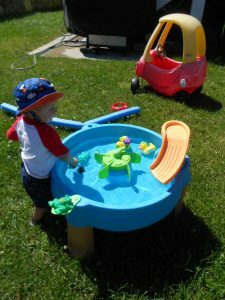 Kids also enjoy scooping, pouring, measuring, and more as they play in a water table. You can make your own water center using a big container of water on the deck. Add in some small bottles, spoons, pails, cups, and small toys. If there’s too much water happening weather-wise to spend some time outside, run some water in the sink. Kids will probably have to stand on a chair, and there’s an almost certain chance that water will drip on the floor, but it’s not hard to clean up. 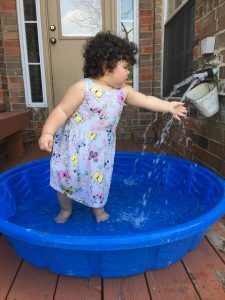 Besides all the ways to play, water play activities engage the senses. Certainly, the feel of water on skin stimulates the sense of touch. Water comes with all kinds of sound effects for the sense of hearing. Although water is usually clear, except in Rio when it turned bright green for some of the diving events, there’s still lots to see. The waves and the interaction with light makes patterns, shadows, and movement. As kids explore and play in water, their brains and bodies are busy, but water is also relaxing. Water is especially beneficial to calm anxieties. Adults get spas, kids get water play. Water rockets, slides, sprinklers, squirters, and water pistols are the opposite of calming. These crank up the excitement and are so much fun. For hot days, spray parks go to the top of the list. 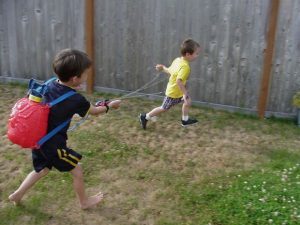 Does your child know how to make water balloons? For a play-of-the-day, inside or out, calm or exciting, can your child enjoy some water play activities? Who knows, maybe there are some new Michael Phelps playing in the water?